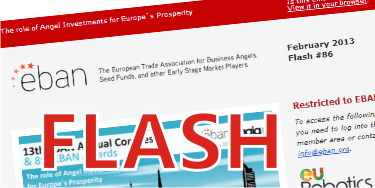 Below you will find the latest EBAN Flash newsletters. If you would like to receive them in your e-mail inbox please subscribe to our mailing list. Discuss Opportunities in East Asia at EBAN Helsinki Annual Congress on June 3rd & 4th! Congratulations to March Scaleup of the Month – Karsa! Angel Investing in Europe Turns 20 – Relive EBAN’s 20th Anniversary Celebration! Congratulations to February Scaleup of the Month – Kinderpedia! Reminder: Participate in the Space Academy, accelerate your start-up on the road to maturity! Join iStart’s Closing Event & Learn about Entrepreneurship Education – February 12th in Brussels! Congratulations to January EBAN/SME Instrument Scaleup of the Month – Digital Sputnik! Introducing the New Knowledge Center, Now with Webinars! Congratulations to November Scaleup of the Month – Neuron Soundware! Join us for the iStart Closing Event – February 12th in Brussels! When Is a Pivot Not a Pivot? Join #BusinessAngelsWeek 2018 -Celebrate Angel Investing and Entrepreneurship with EBAN! 10 Days until 2018 Winter Summit – Join Us on 22-23 October in Luxembourg City! 10 Days Left on Early Bird Sale for EBAN Winter Summit 2018 – 22-23 October in Luxembourg City! Join us at EBAN Winter Summit 2018 – 22-23 October in Luxembourg City! Join us in Barcelona on September 27-28 2018 for the Manage for Impact conference! Invitation to Investors – Register on the European Investment Project Portal and Discover Hundreds of European Companies! CEE Released Competition Will Have its Grand Finale at EBAN Sofia 2018! All of our Knowledge at Your Fingertips – Watch our Previous Webinar on How a Gender Smart Strategy Can Boost Your Growth and Returns! Join the Ranks of 200+ Most Active Business Angels in Europe! EBAN Sofia 2018 – Great Program, Awesome Speakers, Super Workshops! 3S: Manage for Impact – Don’t miss your early bird ticket! One Month Left until EBAN Sofia – Announcing Selected Startups and Detailed Congress Agenda! Invitation to the Joint EBAN/EASME Scaleup of the Month Webinar – Help Pick this Month’s Winner! Join Latitude59 on 25-26 May – the Estonian flagship startup & tech conference! EBAN and WEBIT Partnering for a Joint Investor Summit on 27 June – Join Both Events with a Combined Pass! Apply to the 1st European Woman Business Angel of the Year Award! 4YFN Shanghai – Discover the Startup Technology That Will Be Making a Difference 4 Years From Now. Manage for Impact Conference – Early bird tickets available now! Congratulations to April Scaleup of the Month – Leaf Republic! Mentor-Driven Capital – Join Africa’s Business Angel Movement and start your journey today! Last Call for Startups – Apply to EBAN Sofia Annual Congress and Get Free Passes and Travel! Join the April Scaleup of the Month Webinar and Pick this Month’s Winner! Congratulations to February Scaleup of the Month – Kray Technologies! Join the Upcoming Lean In EU WBAs Webinar for Business Angels! Congratulations to January Scaleup of the Month – Velove! …and more important news in the early stage market! Join the CEE Impact Day in Vienna on 22-23 June! ePlus Video Pitches – Last call for entrepreneurs! EBAN Malaga 2017 – Great Program, Awesome Speakers, Super Workshops! Join the Investors Academy on 5 June and Lisbon Investment Summit on 6-7 June! Be Part of the Business Storm in Lisbon on 1-2 June! 2 of Europe’s Top VCs Speaking at EBAN Malaga and Everything Else You Need to Know! …and more important events in the early stage market! Sophia Business Angels Start-Up Factory – Community Building at its best! Deadline for Startups Extended for Nitro, the Extreme Acceleration Event! Participate in E!nnoVest as Jury Member! Bucharest Stock Exchange Launches Made In Romania – EBAN and Romanian Business Angels are There! Applications are Now Open for StartupYard Batch 8! Special Invitation for Nitro, the Extreme Acceleration Event! Meet the Most Influential Investors and Prominent Startups in the Space Sector at Disrupt Space! Last Chance to Register for WBAF 2017! Discover the EBAN CEE Community! EIB Institute Social Innovation Tournament – Change Tomorrow Today! Open Call For ePlus Video Pitches! ePlus Ecosystem Micro-Grant Results and Open Call for Nitro 3: the Extreme Acceleration Event! CES 2017, What Comes to Mind After a 4-day Immersion? Startups & Entrepreneurs, Apply Today to Be a Part of One of the Best Entrepreneurship Events in the World! Save the Date for EBAN Malaga 2017 – Where Investors Meet the Future! EBAN Winter University Zagreb 2016 breaks the Mold with Record numbers and world-class speakers, investors and entrepreneurs! Celebrating the Record-Breaking Business Angels Week 2016! Business Angels Week 2016 Is Now Launched! Startup Nations Summit comes to Europe for the first time! The African Angel Investor Summit is in 3 Days – Join Us in Lagos! Everything You Need to Know about EBAN Winter University 2016! Applications to Microsoft Accelerator London Are Now Open! Join Business Angels Week 2016! Only One Month Left Until EBAN Winter University – Get Your Tickets Now! One Week Left to Participate in Business Angels Funding Study! EBAN Winter University Early Bird Sale Ends Today! Support Female Entrepreneurship Together with WeHubs! Grab Your Tickets to EBAN Winter University! Apply to Zagreb Connect Contest! Business Angels Week 2016 is Around the Corner! Angel Visit to Silicon Valley, An Exclusive Opportunity! EBAN welcomes 1 new member! … and more important news on the early stage market! EBAN welcomes 3 new members! Congratulations To Cindy Naegel For Being Awarded Business Angel of The Year In Belgium! EBAN welcomes 2 new members! EBAN Members submit your best Scale-Ups to the Startup Europe Partnership Matching Event at the Porto Congress 26-27 May! EBAN welcomes 5 new members! The EBAN Impact Investment Committee Welcomes You to the Impact Investor Meeting 11 April! The EntrepreneurCountry Forum Offers Special Discount to EBAN Community for 19 April Event! EBAN Unites with Curaçao to Establish First Caribbean Business Angel Network! CRANE and the City of Zagreb, Croatia Officially Announce Hosting of EBAN Winter University 2016! At WBAF in Istanbul, CRANE Announced as Host of EBAN’s 2016 Winter University in Zagreb, Croatia! TBAA, GBAN and EBAN will come together for the World Business Angels Investment Forum in Istanbul! Re-live TEDxESA, fascinating talks on a great stage! EBAN welcomes 4 new members! The “Fostering business angel activities in support of SME growth” Guidebook is now Available! EBAN welcomes 6 new members! EBAN 2015 Angel Summit – Re-live it now! EBAN welcomes 8 new members! … and more exciting news and opportunities! EBAN Winter University 2014 Sets New Horizons! … and a strong representation of EBAN Delegation accross events! … and lots of cross-border events! … and exciting news within our community! … and other exciting news! EBAN welcomes four new members! … and many more exciting news and resources! and a great scoop into the European Early Stage Investment market! … and a great and exciting 2014! Is your goal to make a difference in the world? EBAN welcomes 4 new members and reaches now a record number of 29 countries!